Senators doing a pre-study on proposed changes to how Canadians vote got an earful from former auditor general Sheila Fraser this afternoon. Fraser is following up that appearance with testimony before MPs tonight. Preston Manning will also appear. 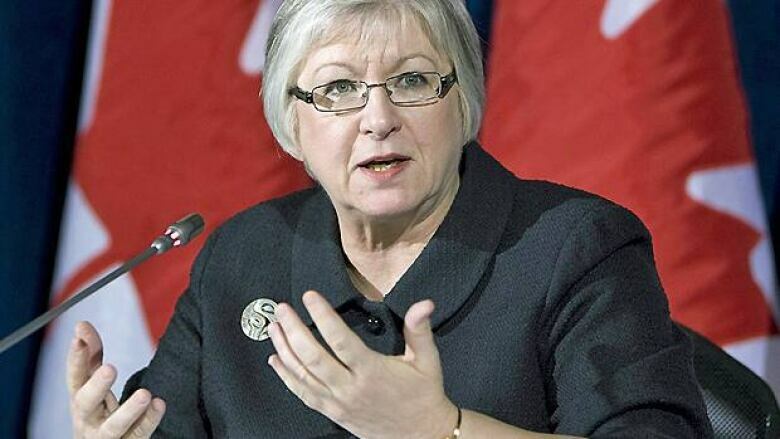 Former auditor general Sheila Fraser says the government's proposed changes to how elections are run could infringe on the independence of Elections Canada. Fraser told senators on the legal and constitutional affairs committee Tuesday afternoon that she's worried about provisions that would "infringe on the independence" of the chief electoral officer, who heads up Elections Canada. In particular, she said she's concerned about proposed restrictions on what the chief electoral officer could speak publicly about and a measure that would force the chief electoral officer to get approval from the Treasury Board for certain spending. "This is clearly an infringement on the independence of the chief electoral officer," Fraser said, and would run counter to how the auditor general's office is managed. Fraser was also to speak to MPs on the procedure and House affairs committee Tuesday evening, along with former MP Borys Wrzesnewskyj and former Reform Party leader Preston Manning, who is now president of the Manning Centre for Building Democracy. Fraser told the senators Tuesday afternoon that she's also concerned about the changes that would prevent vouching as a method of proving one's address. She says her daughter wouldn't be able to vote under the changes being proposed by Minister of State for Democratic Reform Pierre Poilievre. She says her daughter, a university student, lives at home and doesn't have any bills in her name, and gets all correspondence from the university by email. Chief Electoral Officer Marc Mayrand also discussed vouching during his time at the committee, pressing the senators to consider how rare it is to require voters to prove their address in order to cast a ballot. "I'm not aware of any other jurisdiction," that requires proof of address, he said, listing the U.K., Australia, New Zealand and India as countries that don't demand it. "The U.S. does not require proof of address, except in one state. They have other requirements for identity sometimes, but again the proof of address is one issue that's almost unique to Canada," Mayrand told reporters after his committee appearance. Speaking to reporters after the committee, Fraser took on allegations by the Conservatives that she is influenced by her role as an adviser to Mayrand. "I hope that I have shown over the years that I say what I think and I'm not easily influenced by others," Fraser said. She also challenged the insinuation by Poilievre earlier in the day that Mayrand is motivated by a desire for more power or money. Poilievre told senators that Mayrand's "recommendations really boil down to three broad requirements for him: he wants more power, a bigger budget and less accountability. And the amendments that will be under consideration in the final bill that will be adopted does not move in that direction." Fraser said Mayrand is not an officer of Parliament who's trying to be unaccountable. "Certainly from the dealings that I've had with Mr. Mayrand over the years, I find him to be very honourable, to take his job very seriously, and I think we should listen very carefully to the issues that he is raising," she said. "I doubt very much that he is trying to get more power or more money." Fraser says Mayrand is raising good points about the bill. "What is more fundamental to our democracy than the electoral process?" she said. The senators say they'll deliver an initial assessment of proposed changed to the Elections Act by the end of the week. It's an unusually early attempt to have MPs make changes to the bill before they vote to send it to the Senate for further study. Committee chair Bob Runciman says the committee wanted to have some input into the bill before it goes to third reading in the House. Proposed legislation goes through several stages in both houses of Parliament before it becomes law. Bill C-23 is being studied by the procedure and House affairs committee on the House side, and will have to pass third reading before it officially reaches the Senate for consideration. The Senate can send bills back to the House with amendments. Runciman said the Senate's legal and constitutional affairs committee will offer some initial observations and will deal with the bill again once it makes it through the House. Senator George Baker says he expects the House will make major changes to the bill before it arrives at the Senate for review. Baker, a Liberal, argues the provision that would eliminate vouching would disenfranchise Canadians and is therefore unconstitutional. "You know, there is a law that says you can't intentionally pass an unconstitutional measure in Parliament. I mean, you can't do it. So I believe that the amendments will take place in the House of Commons regardless of what the minister says," Baker said. "He's going to have to bow to this. He's going to have to admit that the government of Canada in the past, when these issues arose, said our fail-safe to protect somebody's right to vote is vouching." The interim report could be as few as two sentences, Baker said. "It will bring up the matter of the constitutionality of the legislation. If we send two sentences to them as an interim report, obviously the word constitutionality will be included." Baker also predicted Poilievre will take out the provision to disallow voter information cards as proof of address. Elections Canada ran a pilot project in 2011 that allowed them to be used for 400,000 student and First Nation voters, as well as for those in long-term care. Mayrand wanted to expand the program in 2015. "I think they'll reconsider that because it's the only piece of information that's really up-to-date," Baker said.